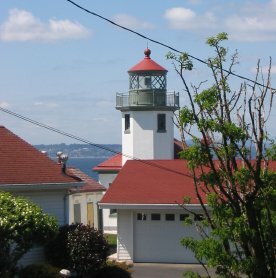 The Alki Point Lighthouse is one of 20 lighthouses still operating in Washington state. The lighthouse located here in Alki is now owned by the United States Coastguard, but it has a pretty interesting history that started back in the 1850's. The southern tip of Elliott Bay is where Alki Point is located, and this was where the famous Denny party (the founders of Seattle) landed. The land changed hands a few times before it was claimed by Hans Martin Hanson. It was Hanson who decided to actually hang the first lantern on the point to warn incoming mariners. It wasn't until 1913 that an actual lighthouse was built on Alki Point. The Alki Point Light Station had a 37-foot tower, with a light that was visible for about 12 miles. At first, the lamp was lit with kerosene but this was eventually replaced with electricity and an electric bulb. After the lighthouse was owned and operated by civilians, the Coast Guard finally took over in 1970 and started running it, actually fully automating the lighthouse in 1984. To get to the Alki Lighthouse, just head south on Alki Avenue Southwest and you should see signs posted. There are some great views from the area, so if you're heading to Alki Beach for breakfast (Alki Bakery), lunch (Spuds), or dinner (Alki Homestead), make sure you spend a couple of minutes to at least check out the Alki Point Light Station. Back from Alki Point Lighthouse.